Amazing Thailand surely did exceed our amazing experience during our last visit. It’s a country filled with eclectic food, beautiful temples, lovely cafes, friendly locals, wonderful hidden spots, and more. With too many gorgeous places that were easy to find and too limited time, we wish we could fit more into our itinerary. Our second trip to Bangkok was designed solely to go eat, get inspired, and take amazing photos at the most Instagrammable places in Bangkok. It’s not the usual touristy spots but is something fresh and fun to try out on your next visit. Bangkok’s cosmopolitan shopping district offers visitors a unique luxurious experience with the rise of modern and charming boutique hotels. There are plenty to choose from, but book early to get the best hotel deals in Bangkok. We found a perfect deal on a 4-star hotel in the Silom area, a good location overlooking a great view of the city skyline. While Silom is known as the financial district by day, it transforms into a vibrant place to be at night. Hotelsa in Bangkok usually prides itself with exceptional service and easy access to the hundreds of shopping area in the city. 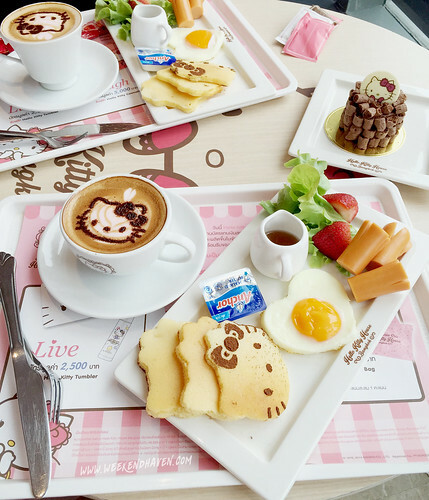 Starting the day right in a happy place with an adorably cute Hello Kitty breakfast set. You can’t miss their massively decorated pink store in a full-scale, three-level complex of Sanrio goodness located at the ground floor of Siam Square One. Get ready to swoon over the insanely cute interiors that don’t disappoint and a selection of dining, shopping, and spa experience in one roof. The food, although there are limited options, offers everything you’re craving and more. Everything is personalized from Instagram-worthy cappuccinos to Hello Kitty pancakes and other sweets. When you’re pressed for time, the best place to see Bangkok’s famous temples in one place is the extensive display of life-size structures at The Ancient City. 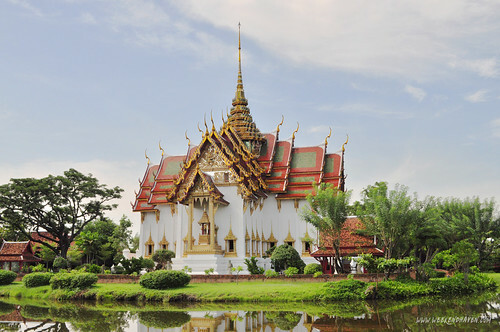 Head down to the South of Bangkok to Samut Prakan province and enter the gateway to Thailand’s Cultural Heritage. The largest open-air museum is home to miniatures and replicas that reflect the architectural craftsmanship of ancient Siam Kingdom. Visitors can indulge in the amazing architecture, arts, and religion in the 320-acre park. Rentals are available for golf carts, bicycles, and trams to help maximize your time. Dinner plans? Head to Bueng Kum District, located around 30-minutes away from the city and just at the outskirts of Bangkok. This is a whimsical little village that involves no chocolate but will welcome you in a European-themed lake house dining and park experience. 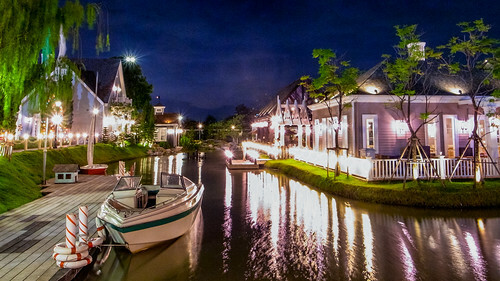 This romantic dining destination is one of the most Instagrammable places in Bangkok. Chocolate Ville entry is free, so expect a bunch of tourists in the late afternoon. It’s a perfect way to cap off the night, however, as appetizing German pork knuckles and beer are served here! We hope we’ve got your Pinteresting and Instagram-worthy content covered. Let us know more places to check out when in Bangkok. Some great tips. Keep it going. Love Thailand and there is always something new to discover. Great photos! I would have a blast shooting the city! Love the Hello kitty cafe, as for Chocolate ville… it’s just beautiful. My boyfriend is heading to Bangkok within the next few weeks, I’ll definitely mention Chocolate Ville to him. Looks amazing. What a great summary of some fab spots – have no doubt this post will be used by many several times over! I’ve just got to get flights to Bangkok booked! Beautiful places! Definitely verrrrry instagrammable places. I want to try to visit Bangkok this year, hope my plans push through hehe. I recently fell in love with Bangkok! It was one of those places I didn’t really like until last time I went! I definitely feel like there’s so much to the city. I’ve done the typical Bangkok stuff- but I’d LOVE to check these places out! Such a good list – Bangkok is such an amazing assault on the senses, such a wonderful city. I did not know Chocolate Ville existed, it looks beautiful. Will definitely have to add this to the list if I visit Bangkok again. Oh wow your photos are just beautiful! I loved Bangkok on my visit and this just makes me want to visit again to see these amazing spots! That Hello Kitty Cafe looks like the perfect place to catch a few novel pictures, hope it was as tasty as it looks! I loved your night photographs, they are awesome…. Super like.